Calling all action film fans. Especially if you favor or love the Hong Kong style which basically hasn’t a lot of dialogue, and is often quickly paced. 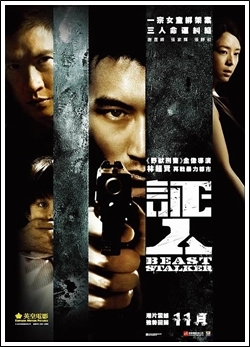 Beast Stalker is a 2008 release and about the worst thing I can say about it is that the title is a bit misleading. 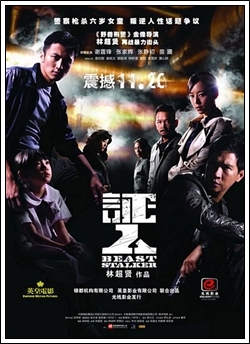 Dante Lam previously co-directed, with Gordon Chan, the excellent Beast Cops in 1998. That film was nearly unanimously acclaimed, so using ‘Beast’ in this title might be an attempted marketing ploy for knowledgable film folks. Nevertheless it has all the style and chops that Lam is noted for – gritty and tense situations which are amped up by a jittery hand-held camera, strong characters who are both good and bad, and some very fine use of lighting and slow motion. The story is a bit hum-drum as it starts: A well-connected criminal is convicted and being driven to prison. His gang engineers a way to spring him out of that car. 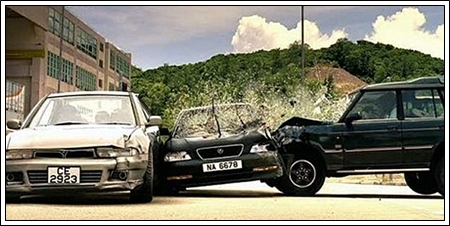 Then a massive multi-car crash occurs involving a number of vehicles. One car is the one in pursuit with Sgt. Tong (Nicholas Tse, Hong Kong’s version of Johnny Depp). Another is the car driven by Prosecuting Attorney (what we call an A.D.A. in the States), The third car is the one driven by Hung (a hoodlum for hire played by Nick Cheung). And of course, the first car with the convicted but escaped criminal. These characters will all connect in the heart of the movie as well as the crash. Without revealing too much, there is a fatality in the crash…but the victim was shot and not killed by the impact. It is a story that as we get deeper and deeper into it, we discover that every character is multi-faceted. No one is all good or all bad. Lam handles the action very well, and a few of the action set pieces are exceptional. Some of this film is truly edge of your seat thrilling. Some of this you’ve seen before – you know – the villain that gets up again and again. And for all the shots fired, hardly anyone is hit by bullets. Despite these facts, or should I said factors, the film doesn’t disappoint when it comes to tension, thrills, and drama. There are a few surprises and revelations which may or may not propel the story forward, but instead, they provide you with some added depth to a few of the characters. And believe me there’s nothing wrong with expanding a character, especially in these days of card-board villains, shallow female roles, and tough as well as thoughtless heroes..
My overall impression is that this is a well-made actioner, that does keep you involved, and doesn’t need to resort to an overkill of blood, gore, and body-parts. This entry was posted in Hong Kong Films/DVD, Movie Reviews. Bookmark the permalink.